These are lyrics by Samantha Mumba that we think are kind of nonsensical. 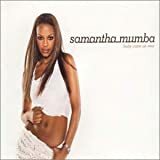 Samantha Mumba's, "Baby Come Over"
All the publishers of rhyming dictionaries must be making a mint from these contemporary pop artists and it seems Mumba here have been caught in the act too. Just making words rhyme doesn't constitute general coherence but evidently, some think so, therefore we have strange instances like 'going from the start' of things unexplained and making unknown things 'all right'. Would it hurt just to think for a few more seconds what to convey clearly in a song? Samantha Mumba's, "Gotta Tell You"
This chorus makes absolutely no sense on so many levels it's enough to make anyone literally speechless. The second half has nothing to do with the first, which in turn is a showcase of really contradictory lines [right at the beginning of the first verse, Sam talks about how 'your love for me came as a waterfall', so how come she doesn't know all of a sudden if he loves her or not?] Then in the second half, what is it that she has to tell him? Samantha Mumba's, "I'm Right Here"
Come on, make up your mind. Heck, maybe the things you're looking for aren't in either place.